Lingmoor Guest House015394 44947work015394 44947fax Guest HouseLingmoor is a beautiful Victorian guesthouse in Windermere in the heart of the English lakes only 200 metres from Windermere railway/coach and bus station. Wi-Fi throughout. Choice of breakfast. 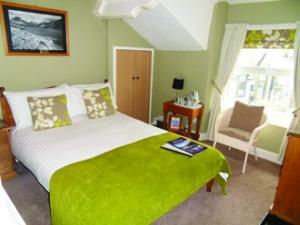 Recently refurbished rooms. Personally run by husband and wife team Paula and Graham Smith who realised their dream in 2009 when they found Lingmoor Guesthouse through the television show Place In The Sun Home Or Away after a 4 year search for the perfect place. Chef Graham prides himself on his fabulous Cumbrian breakfast, whilst Paula looks after front of house. Many guests comment on this winning combination which along with the convenient, central location and beautiful period property make Lingmoor Guesthouse the ideal place to stay. All rooms are double glazed, have flat-screen TV's with integrated DVD player’s and well-stocked hospitality trays. Wi-fi is available throughout the house. Children over 5 years only. Exclusively for non-smokers. Single travellers welcome. Full library of books, magazines and detailed walks are available for guests to enjoy during their stay. Packed lunches also available. Lingmoor Guest House is only a 15-minute walk from Lake Windermere and the same distance from Orrest Head which offers fabulous views of lake Windermere. The World of Beatrix Potter is only a 5-minute bus ride away, 15-minutes walk and Hill Top is 4.5 miles from the guest house. The grid shows the prices and daily availability from Fri 19 Apr 19 to Sun 28 Apr 19. It's easy to check availability for particular dates; just use the calendar to choose the check in date, select the number of nights and click the 'Search' button. Click the Book or Reserve button to book the highlighted days. With Book the room booking will be confirmed immediately, with Reserve the room reservation will be confirmed within 24 hours..